Now there is a Minecraft Master T-Shirt. And this t-shirt is made for all the people that are really good at playing Minecraft. The shirt is available in styles for men, women, and kids and comes in a whole bunch of sizes and lots of colors too. On the shirt you can see a dirt block that has grass on top and above it you find the text “Minecraft Master” in the typical Minecraft font. 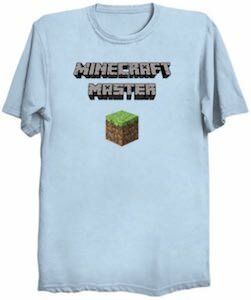 So if you are a gamer that loves Minecraft a lot then you can be the lucky one that can be wearing this shirt and tell the world that you are a Minecraft Master. If you like classic video games then you know about Mario Kart and now there is an amazing Mario Kart t-shirt. The t-shirt is available in styles for men and women and it comes in sizes Small – 6XL and comes in black or navy blue. 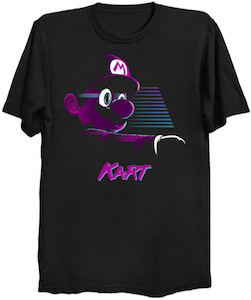 On the t-shirt you can see a dark purple image of Mario and it seems like he is driving his cart with speed lines in the background and below Mario it says Kart and that makes it the perfect Mario Kart t-shirt. The whole dark design works really nice making it really look amazing and special. Now you can have your own Game Boy t-shirt that makes it looks like you are wearing the classic Nintendo handheld console. The shirt is available in styles for men and women and comes in many sizes ranging from Small – 4XL and all are made from 100% cotton. The t-shirt is just fun for anyone the likes video games as the Game Boy is a classic that almost everyone knows. 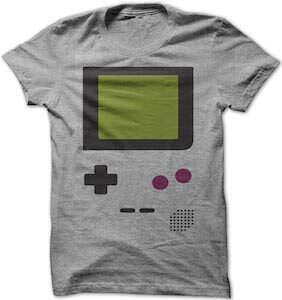 You could even use this as a costume t-shirt for Halloween as it does make it look like you are wearing a game console. Oh yes! The classic video games of Nintendo. Where it all started for most of us. 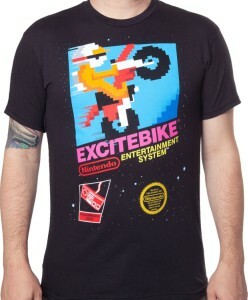 On the front of this t-shirt you will see the game Excite bike just as it looks on the front cover of the Nintendo game cartridge. Find the 8bit pixel image of a motocross dirt bike with the official logos of “Excitebike” “Nintendo Entertainment System”. Also check out the special logo of the programmable series controller and the Nintendo seal. Available in a wide variety of sizes that range from Small all the way up to 3XLT so all can enjoy this classic Nintendo t-shirt. Made from 100% cotton to give you a very durable t-shirt that will also be super comfortable and soft to wear. 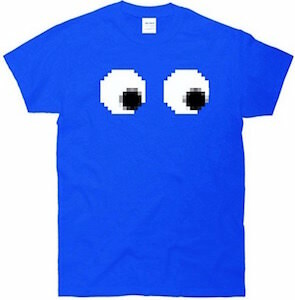 Video gamers will know exactly what this t-shirt means, and maybe even sympathize too. 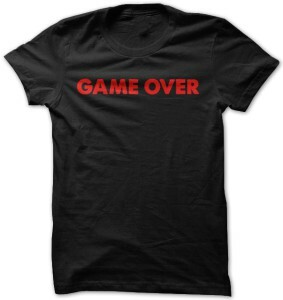 On the front of this black t-shirt you see a red “GAME OVER” printed across the front chest. The combination of shirt and print colors make this look just like the screen you see in a video game when you loose and are done. This is a men’s fitted t-shirt that is available in a wide selection of sizes that range from Small to 4XL. Made from 100% cotton to give you a very durable long lasting tee that will also be super comfortable and soft to wear. 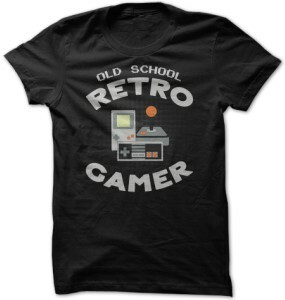 On the front of this t-shirt you will see the saying of “Old School Retro Gamer”. With this text you see an image of some classic gamer things like the Gameboy, Nintendo controller and an Atari joystick controller. Made from 100% cotton to give you that super soft and comfortable shirt that will also be very durable and last you a long time. Also have a look at all of the different t-shirt colors a total of 6 fun and vibrant to get this print on. The retro gamer t-shirt is available in a wide variety of men’s fitted sizes that will range from Small to 4XL. Also check out the women’s fitted sizes and hoodies too. Think way back to the days of early video games and I’m sure that Burgertime will come up in conversation. Who thought it would be so fun to make burgers during your video game playing time. Now you can relive it with this amazing t-shirt. 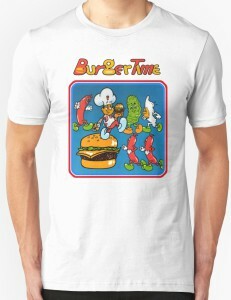 The graphic on the Burgertime T-Shirt is super colorful and a great representation of the video game from the 1980’s. It features Chef Peter Pepper, a completed burger and the nasty Mr. Egg, Mr. Pickle and Mr. Hot Dog who tried their hardest to stop you from making the ultimate burger. It also has the title of the game in red and yellow letters on top. This t-shirt comes in many different colors for the background. It ranges in sizes from Small to 3XL in a unisex fit, so it is sure to make any video game fan excited. The t-shirt is made from 100% cotton for pure comfort. How about this blast from the past, remeber the classic computer game of Ski Free and the monster that would haunt your childhood. This is a t-shirt that features Ski Free the classic windows computer game and some art of the scary monster of the Abominable Snowman that would chase you the skiier downhill, along with this image there is also the text of “SKI FREE AND DIE”. Available in a wide selection of adult men’s fitted sizes that will range from Small to 4XL and it is made from 100% cotton to give you that very durable long lasting shirt while also super comfortable and soft to wear. When it was time to take the classic Atari arcade games to a home video game console people went crazy and Atari was a new household name. 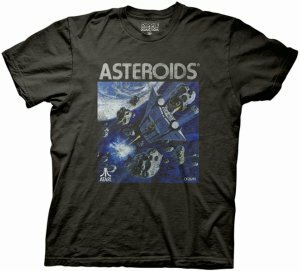 On the front of this shirt you will see one of the Atari video game covers Asteroids in color you see a large ship ready to destroy all of the floating astreoids coming its way and find the name “ASTEROIDS” above this image. Made to be both durable and soft as it is made frome 100% cotton, the Atari Asteroid t-shirt is available in a wide selection of adult unisex sizes that range from Small to 2XL.